With over 225,000 copies in print, DK's Big Ideas series has struck a chord with readers fascinated-but also intimidated-by complex subjects like philosophy, psychology, politics, and religion. 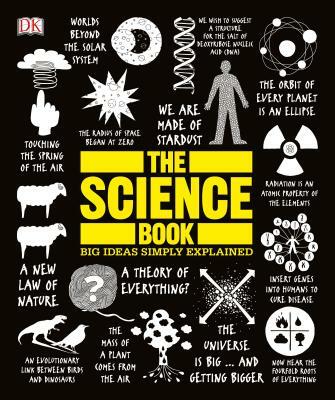 The newest title in this successful and acclaimed series is The Science Book, an inventive visual take on astronomy, biology, chemistry, geology, and physics. With eye-catching artwork, step-by-step diagrams, and illustrations that break down complicated ideas into manageable concepts, The Science Book will have readers conversant in genetic engineering, black holes, and global warming in no time. Along the way are found mini-biographies of the most well-known scientists, and a glossary of helpful scientific terms. For students, and students of the world, there is no better way to explore the fascinating, strange, and mysterious world of science than in The Science Book. DK acts as the parent company for Alpha Books, publisher of the Idiot's Guides series and Prima Games, the world’s leading publisher of strategy content for PC and console video games.